BEAUREGARD, Pierre-Gustave Toutant (1818-1893) was an American military officer who was the first prominent general of the Confederate States Army during the American Civil War. Following his military career, Beauregard returned to Louisiana, where he advocated for Black civil rights and Black suffrage, served as a railroad executive, and became wealthy as a promoter of the Louisiana Lottery. War-date Confederate Autograph Letter Signed “John Clark” 3pp. octavo, Bellefair Mills, Stafford Co., Virginia, June 18, 1861, addressed to General Beauregard with his ANS on verso. The letter reads in part: “...I received your acknowledgement of the Rail Road Map I had the honor to send you and am glad that it be useful to you. The object, however, of this note is to state that my profession is a minister of the Gospel...I will thank you to send me a passport, if not, in your judgement inconsistent with the public welfare. 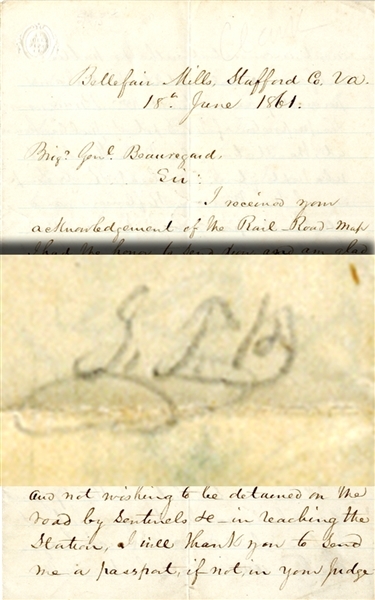 I will state that I am personally known to ....Captain R.H. Simpson of the ‘Warren Rifleman’ and all his company have been in the habit of attending my ministry at Front Royal....” With Autograph Note Signed on verso “Give a pass. I see no reason why you should not take the cars here if you desire it. I regret I have no need of the services of your son or I would employ him with pleasure. G.T.B.” Fine condition.